Keith Thirgood is an experienced outdoorsman and artist. He will lead us by canoe into the back country of Kawartha Highlands Provincial Park, Ontario, where the views are spectacular. The same type of view that inspired the Group of Seven. This is a self-supplied retreat. You need some familiarity with canoeing and camping to do this retreat. 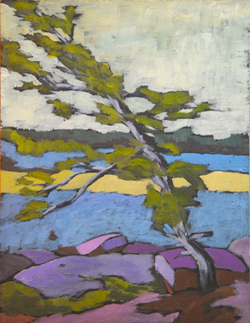 For more information on the Wilson Street Studio Art Retreat in Kawartha Highlands Provincial Park, click here. Keith Thirgood takes you into the amazing scenery of the La Cloche Mountain area of the Killarney Region. This area was often painted by members of the Group of Seven. When you see the ruggedness of the landscape, you will know why. For more information on the Wilson Street Studio Art Retreat in Killarney, click here. To watch a YouTube video of the 2013 Ottawa Valley Retreat, click here to open a YouTube window. To watch a YouTube video of the 2012 retreats, click here to open a YouTube window.